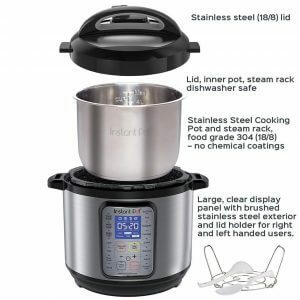 What makes Instant Pot IP-DUO Plus60 9-in-1 Unique? The most important function of an instant pot is pressure cooking. However, most instant pot models don’t have a pressure cooker option. The new Duo Plus caters for this need by incorporating the pressure cooker option in its programs. With the addition of pressure cook button as opposed to the manual button, you can now use the instant pot as an electric pressure cooker. People always complained about the lack of clarity and complexity of the manuals of previous instant pot models. However, the new Duos Plus comes with a much-improved manual that is well designed and easy to understand. You can also find the manual on the manufacturer’s website, and much of it applies to many Instant Pots. The Instant Pot IP-DUO Plus60 9-in-1 comes with clear marking on the inner pot to help you know how full your pot is so as to avoid over filling it. They also come with an Instant Pot label to help you label your appliances if you have more than one pressure cooker. This helps you to differentiate among them. The Duo Plus has a new blue LCD that allows you to adjust your pressure levels and cooking settings at any time during your cooking process. It has four icons to enable you to monitor the status of your cooker; Pressure Cook, Heat, Sound, and Keep Warm. The Pressure Cook indicates that the pressure cook program is selected; The Heat indicates that cooking or heating is in progress; Sound indicates if the sound is on or off; Keep Warm indicates if it is ON or OFF. Of course, all the best features that make the regular DUO instant pots worth buying are still there. The DUO Plus comes with multiple PSI and yogurt making settings, but it is the improvement of the control panel that makes it a game changer for many people who find it hard to use and understand the display on the older models. The bigger display makes it much easier for users to read the programs chosen. This cooker features seven functions for virtually unlimited cooking options; sauté/browning, pressure cooker, yogurt maker, warmer, steamer, rice cooker, and slow cooker. You can also use the large control panel to access the 14 built-in smart programs. Tip; the 8-turn key function keys in this instant pot make the most common cooking tasks a breeze. The Instant Pot IP-DUO Plus60 9-in-1 helps you preserve the nutritional value in food ingredients thereby allowing you to cook healthy, nutritious meals. As long as you have a recipe guide with plenty of delicious, easy-to-make meal ideas, cooking them become a breeze. The keep-warm setting and 24-hour cooking delay timer allow you to plan your meals in advance. This appliance can take the place of other kitchen appliances such as rice cooker and slow cooker since it incorporates all these into one appliance. This helps to save the space on your counter. The Instant Pot IP-DUO Plus60 9-in-1 has many functions and features. It is a slow cooker, pressure cooker, yogurt, and instant cooker. Its multiple functions and small size mean that you can comfortably replace various small appliances with it. While there are many competitive products, the Instant Pot IP-DUO Plus60 9-in-1 stands out. Does the pressure cooker listed abobe have an automatic shut off? Can the keep warm setting be set up (in advance )to immediately follow the cooking cycle? Does this also cook rice?